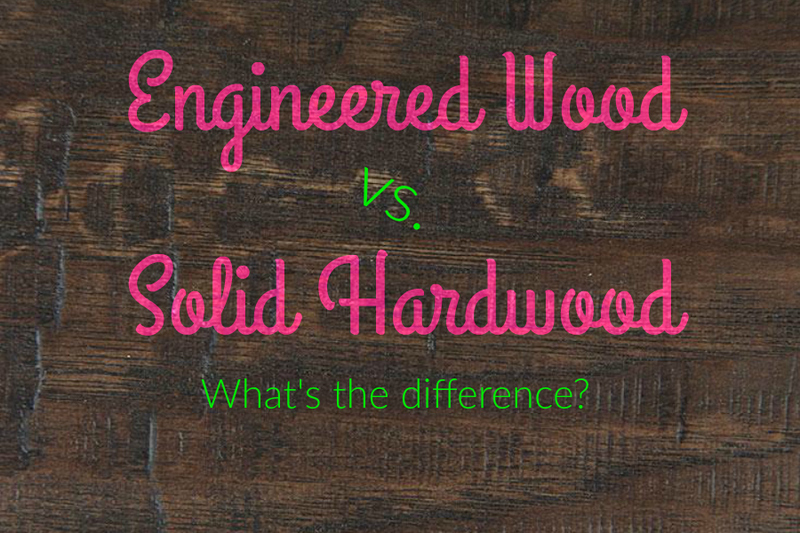 Engineered Wood vs Solid Hardwood: What’s the Difference? Ever wonder what engineered wood actually means? We’re getting down to the details on engineered wood vs solid hardwood to share what sets them apart and help you decide which is the best choice for you. Nothing looks more polished and professional in your home than wood flooring. The classic rustic look (with great durability and more options than ever before!) makes your home charming and inviting. Previously, wood flooring was limited as far as options go but, these days, it comes in all types of colors, textures, and even installation methods. Now, instead of just traditional, solid hardwood, manufacturers have welcomed a new kid on the block to the hardwood flooring family: Engineered Wood. You may ask yourself, with all these wonderful new options, what is the difference between solid hardwood and engineered wood? Well, we’ve got the answer! Take a peek at these little facts to uncover the secrets of wood flooring. Engineered wood is made up of a thin veneer top layer of solid wood; however, the remaining base of the product is made up of plywood. Engineered wood is just as durable as traditional hardwood and provides the same classic, timeless look. Cost. Engineered hardwood is often less expensive due to the plywood base. With solid hardwood, you’re paying for an entire plank made up of that material, whereas with engineered, that expensive layer is on top where everyone can see it — showing you off, making you look fancy, but the less costly, durable plywood is holding it up. It’s like instead of buying your entire outfit from Banana Republic, you got your underwear from Old Navy. The part people see looks fancy and expensive, while the part underneath is holding strong, doing its job. DIY Installation. No contractor? No problem! Engineered wood is installed with a tongue and groove system – the material can either be loose laid or installed with glue. Versatility. This isn’t Goldilocks here. Things do not have to be “just right”. Engineered wood can be installed on all levels, making the possibilities endless. Less expansion/contraction. Compared to solid hardwood, engineered hardwood is less likely to expand and contract. However, upon installing the product, we advise that you leave about ½” space for expansion. That way if it does expand and contract, then it has “breathing” room. Options. Engineered hardwood comes in hand scraped, textured, smooth and distressed surfaces, giving you the option of adding a bit of special touch to the product and complementing your decor. Green. Engineered wood flooring is a more environmentally friendly product – that means Al Gore and all your recycle-loving friends will approve, and it looks just as good on your floor! Cannot be refinished. Unlike solid hardwood which can be refinished, engineered wood has a thin wood veneer on top of the product. Attempting to refinish the engineered wood could potentially damage the product. Mindset. Some people prefer to know that hardwood is strictly made out of wood, just like purchasing designer jeans, you want to make sure it’s authentic. Though engineered wood is not made out of 100% solid wood, it still gets the job done and, usually, at a lower cost. For me? I’d rather take a price cut and still have a stylish floor to show off rather than paying for those designer jeans with a higher price tag. All levels. Entry, upstairs, downstairs, in the sky, on a boat, here or there, anywhere! Any climate. Engineered hardwood is a great source for installing over radiant heating system, and humidity is no issue for this beasty floor! Rooms without a lot of water (full bathrooms and kitchens are not advised). Keep in mind with wood flooring it is not ideal for the product to be installed in any areas where flooding or excessive amount of water will be present. Solid hardwood is just that: made up of solid wood through the entire plank. Hardwood flooring is made from yours truly: Mother Nature; solid hardwood is made out of thick solid wood planks with a thin wood veneer on top. All that fancy wording means the product is hand scraped and durable, making it built to last. Keep in mind, with solid hardwood, though its elegance preserves, it can double in dollar signs depending on the color and style you prefer. Refinish to look like new. Unlike engineered hardwood, solid wood can be refinished which means with just a bit of elbow grease you can rebuff the product to look brand new. Solid hardwood can be sanded down and refinished several times. Bragging rights. Know what that means? It’s time to put on a show for your friends and family to show off your beautifully polished and elegant solid hardwood floors, and make sure they know it’s solid hardwood. Cost. Solid hardwood is made out of 100% wood, making it a higher-cost product. If you’re looking for the consistency and appearance of solid hardwood without a budget in mind. Solid hardwood may be right for you. More challenging installation. 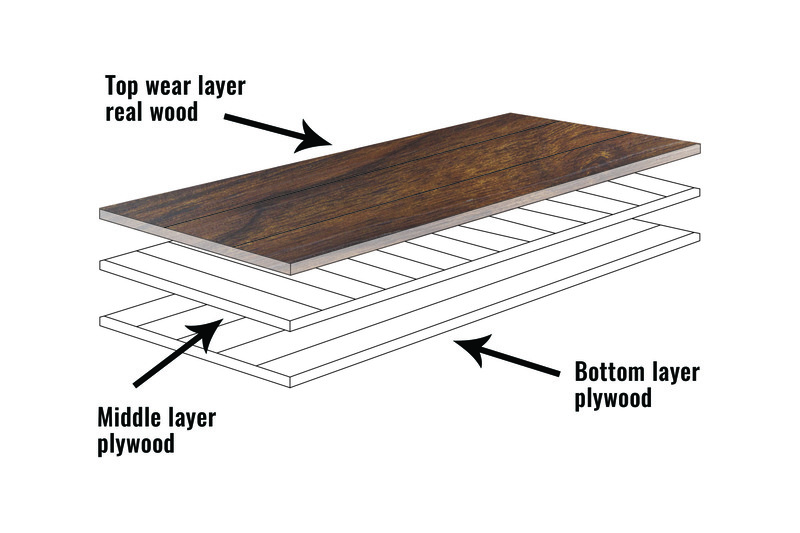 Unlike engineered hardwood, solid hardwood has a little more process to installation. For further installation steps please check out Solid Plank Flooring Installation – on Installation Information. Fewer options. Wood does not always come in various colors and texture. Solid hardwood comes strict color depending on which wood style you prefer. Expansion/contraction. Solid hardwood can expand and contract due to changes in temperature. We recommend to leave ¾” expansion space around the perimeter of the area. Entry and upper levels only. 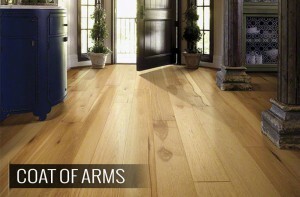 For peace of mind, installing solid hardwood is ideal for ground and upper level areas in your home. Solid hardwood is not ideal for your basement due to moisture issues. Humidity controlled environment. Some like it hot! Solid hardwood does not. Keep in mind that higher humidity increases the potential for expansion and contraction. Rooms without a lot of water (no bathrooms or kitchens). Just like engineered wood, this guy does not want to go on Splash Mountain. As you can see, both flooring options have their place, and there is always an option to fit your needs. We recommend taking some time to look at the various selection of both engineered and solid wood flooring, ordering samples, and deciding what you like best. You may be surprised that what may appear as solid wood is actually engineered wood. Solid hardwood is timeless and gorgeous but, let’s face it, high maintenance. Engineered wood flooring supplies the same, classic effect but, often, at the faction of the cost. Either way, both products will provide a luxurious and polished finish to your space. And we promise, whichever wood flooring you choose, you can still knock on wood. Solid hardwood is timeless and gorgeous but, let’s face it, high maintenance. Engineered wood flooring supplies the same, classic effect but, often, at the faction of the cost. Either way, both products will provide a luxurious and polished finish to your space. And we promise, whichever wood flooring you choose, you can still knock on wood.